Is that you? Did you cut your hair? So. Cute. I'm also LOVING your shirt. Gosh, it is so good to see you. We haven't met in this break room in a while. I am having the hardest time giving this place up. I just can't do it. I want to keep it. I've invested in a LOAD of Fabuloso to get this place shiny again for you and, you know, once you fork it over for Fabuloso, you just can't walk away. Could you just poke your head around and let me know what you think? CAN YOU SEE THE SIDEBAR? Is the font too small? Is it too hard to read? Is the font way too large? Are the colors ugly? You see, I have had a customized blog for a long, long time. I am moving away from that so that I can just manage it all by myself without paying someone to come in here and tinker with everything. That is why I would really appreciate your feedback. I just need someone else looking at it and telling me the ugly, ugly truth, much like my own sons would. My 9-year-old shoots it straight. The thing is, he doesn't know much about websites, so I would rather that you tell me what you think about website-related issues. I had a dose of his honesty this morning. I've got issues with eyebrows. When I was four years old, I was putting plastic make-up on my neighbor's dad. I know, girl. That is strange enough. Anyway, he turned just so in his spinning recliner and I fell face first into the coffee table's corner. This placed a nice gash in my right eyebrow. Hair won't grow there and I've had eyebrow issues ever since. I am clueless when it comes to shaping them. Anyway, I got a bad case of overplucking the other day, so I tried to fix it with an eyebrow pencil this morning. "WHAT is wrong with your eyebrows?" my 9-year-old asked me as soon as he saw me this morning. "What do you mean?" knowing full well what he meant. I was going to try to sneak my eyebrows past everyone today. I wasn't expecting to get called out so soon. "They're all curved wrong or something." "Tell me what you really think." "You look like one of those Harry Potter characters at the bank at the roller coaster ride at Universal Studios." Man, I'm telling you. My family is super lucky that I laugh at these things. I had to laugh at his boldness. 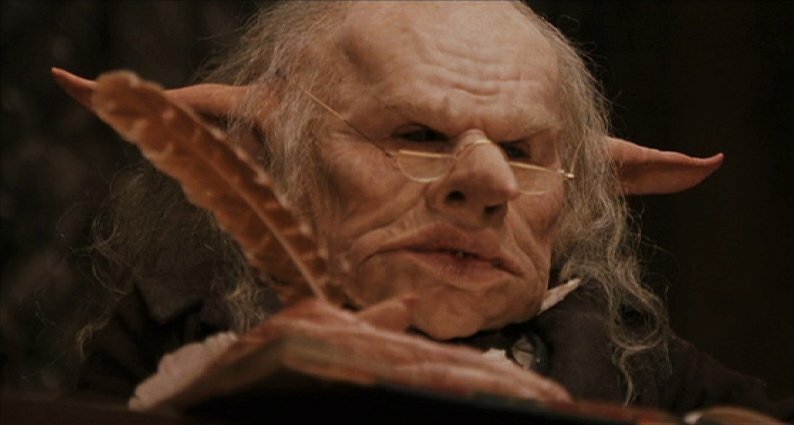 We'll have a discussion later about how those Gringott guys don't even HAVE eyebrows. FOR GOODNESS SAKES. I am happy to be back on this blog. If you are a blogger and have something that you'd like for me to read- or anyone to read that may come across these comments- please place a link in the Facebook comments below. And, again, any feedback about the website or mobile site would be so appreciated! !